Put to bed. Most of the country before the Los Angeles Kings games end. Now on the verge of being put to bed, the St. Louis Blues. If there’s a more dominant team this post-season than the Kings, I haven’t seen it. There hasn’t been a sweep in the playoffs yet, but we just might see it in this series. Everything just clicked for L.A. at home in Game Three. Winning the battle of the boards, laying out the big hits and even putting home a power-play goal. Seriously, 46 hits is no joke. Mike Richards and Gordie Howe in the same sentence, is no joke either. In the first, a little spin around shot by Justin Williams, got L.A. on the board against Brian Elliott. A nice starter for a period that saw just 12 shots combined. St. Louis was able to get on the ledger early in the second. Off a neutral zone turnover, Kris Russell fed Chris Stewart for his first marker of the playoffs, knotting the game up at one. Shortly there after though, Los Angeles would strike right back. A long pass off the boards by Matt Greene, setup a splendid opportunity for Dwight King. King on the break, netted his first of the post-season, as L.A. regained the lead at 2-1. Later in the frame, Richards, who fought in the first with Jamie Langenbrunner, brought out some of that first round magic. Just as he had against the Vancouver Canucks, Richards took a sharp angle shot to catch the Blues off-guard. After the puck crossed the red line, L.A. had the first power-play tally of the series and a 3-1 advantage. The Blues did manage to make a game of it though with Stewart in the third again. A rare miscue by Jonathan Quick, a dropped puck, allowed Stewart jumped on the loose biscuit in front and buried it. However, just as they did in the second, the Kings struck back and all but put it out of reach. This time, Richards found Drew Doughty in full stride and Doughty was able to best Elliott for his first marker of the playoffs. 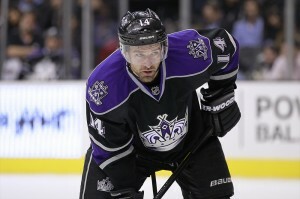 A 4-2 victory for the Kings and a “Gordie Howe Hat-Trick” for Richards. As mentioned above, Los Angeles threw its weight around, thew the puck in the back of the net and are on the cusp of throwing St. Louis right out of the playoffs. If you’ve watched this club play in these Stanley Cup Playoffs, it’s not so much surprising anymore, but it’s certainly no less incredible. A commanding 3-0 series edge, with the chance to close it out on home ice. The Kings will attempt to close out the Blues on Sunday afternoon in Los Angeles.